The Early Childhood Unit (Pre-K and Kindergarten) at Green Acres School introduces young children to the joys of thinking, imagining, questioning, experimenting and discovering! The goal of our work with these youngest students is to instill a love of learning and habits of mind that will serve them well throughout school and life. Teachers create a warm, secure classroom environment where children are exposed to a wide variety of materials and guide them in open-ended, hands-on activities to ignite their natural curiosity and creativity. These include a multitude of opportunities that launch children enthusiastically into the world of mathematical thinking and literacy. Within a carefully constructed framework, students are invited to make choices as they explore and learn. A blend of small Homecorner pursuits and larger group activities helps broaden students’ social world. Regular time with the school’s special subject teachers (art, physical education, library, science, spanish, and creative movement) is critical to the integrated curriculum and music is a part of each school day. Cross-grade times with student buddies from older grades, as well as participation in Lower School assemblies connect our young students to the larger Green Acres community. The Early Childhood Unit engages children in learning about themselves in relation to the world beyond their family and home. Because children learn through every social interaction, our program provides many opportunities throughout the school day for children to interact with peers and adults as they explore the classroom environment and outside spaces. Through connections with classmates, children develop a more complex understanding of social relationships. They establish a sense of trust and well-being as they learn to share space, materials, friends and teachers. Play and exploration are an integral part of the work of young children and an integral part of how they learn. 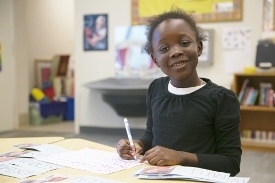 Through both self-selected and structured activities, teachers facilitate natural opportunities for children to practice literacy and math skills in meaningful and contextual ways. Play also serves as the means through which children develop higher-order thinking skills foundational to later academic success such as planning, organization, and problem solving. The classrooms in the Early Childhood Unit are purposefully designed to nurture imagination and creative risk-taking, fostering intellectual growth across all domains. 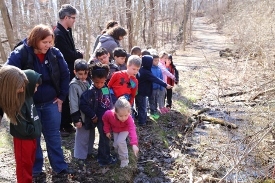 Pre-K and Kindergarten students spend a significant portion of their school day outdoors, where they explore and interact and begin to develop an understanding of the natural world. The outdoors is an extension of the classroom. In small groups with teachers, they visit various school playgrounds on our campus and follow paths through the surrounding woodlands. Off-campus field trips to places like local parks, nature centers, theaters, libraries, and the zoo expand their world.